Walter Hartright is a drawing tutor hired to teach the young and beautiful Laura Fairlie the wonderful world of art. The time they spend together draws them closer, but soon Laura is promised to a nobleman. As Walter mourns the loss, his future becomes intertwined with an elusive woman in white who harbors a dreadful secret, but holds the key to winning Laura's hand. Follow along as Walter unravels a sordid tale of diabolical plots and treacherous lies. Explore beautiful Victorian mansions searching for clues about the mysterious female. Who is this Woman in White? Where did she come from? What secret is she hiding that puts her in danger? The history speaks for itself when it comes in digitalizing the stories and novels from our past and the outcome of those undertakings. Those themes are one of the most used in the casual game world, and frankly they start getting a bit tiresome as most of those themes are already used to many times, as you probably seen them all, from HOG to time management to adventure, etc… Victorian Mysteries – Woman in White is a game based on the novel from the 1858 Woman in White and the potential of the game was very high in deed. Luckily for us, that potential was used almost to its max and we got a game created by high standards of hidden object games. The story goes with Walter Hartright entering the scene (you) as you are hired to be a tutor for to lovely but also very rich young women in painting skills. He was hired by Mr. Fairlie, the father of the two young ladies. But on his way to mansion to start the tutoring, he meets a very strange woman, actually a woman in white dress, which told him a lot about the Fairlie’s… His tutoring turned out to be very disappointing for him, as the result of his tutoring he has fallen to the charms of the Fairlie sisters, especially to the ones of Laura Fairlie. After that he couldn’t stop thinking about her and this caused great disturbance within him, especially when he found out she was promised to another man, and that man is returning very soon for her. As soon as you arrive at Limmeridge manor, the game begins. Not wanting to wake the servants, Walter decides to find his own way into the house. The game is adapted in two ways of gameplay that is two modes (casual and expert). The difference is of course in the difficulty and how you want to play the game. 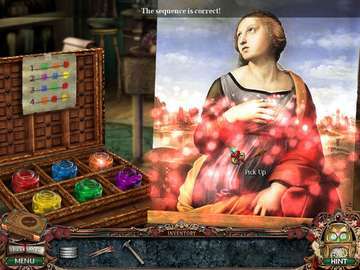 The casual mode has lots of privileges and advantages that ease up the gameplay, like the offering shorter recharge times for the hint and skip options, and "sparkles" to highlight areas where hidden object searches can be found. Another option that pretty much every player will be thankful for is when the room in which you are located is clear the game notifies you when there is nothing else to find. However, this doesn’t mean that the search is over for that room for good, as other items can appear that need to be found sometimes later in the game in that specific ‘clear’ room. 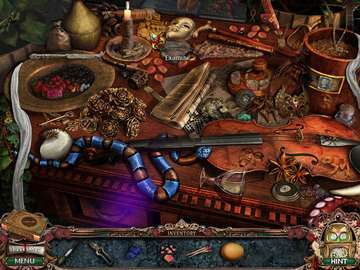 The game is not just about seeking and finding hidden objects. The game provides a lot of reading that can keep you interested in the game additionally as you can find information about the characters, story and almost the complete family that concerns the story. This added to the games background and gives you a more perspective look on the game filling in the blanks that the game doesn’t provide with the gameplay itself. 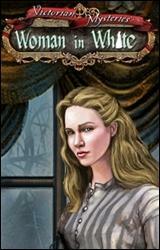 The gameplay in Woman in White is what you would expect from a hidden object adventure game. You have the main adventure screen where you see all the locations and scenes that you can visit, with the ability to interact or zoom closer on various objects in each scene. Depending on what mode of the game you will select, so does the difficulty of course but and also the length of the game. However, besides that the skip button plays not so significant role, but still plays a role in the games length. The mini-games aren’t even so, such a challenge as they provide minimum difficulty so skipping them probably won’t be an option. On the other hand the hidden items searches are something that I more than difficulty but enough challenging for you not to get bored. 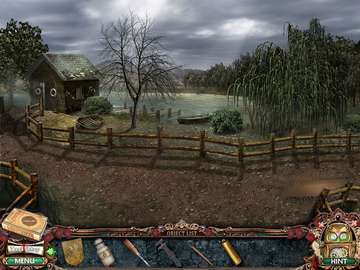 Incomplete hidden object searches are highlighted in each game screen but puzzles and some uncollected inventory items are not, and that means pixel hunting. This option has become quite bothersome for any player in the HOG, however the fact the game tells you on the end is there or not any items left helps in that dilemma. The graphics of the game is adapted to the 19th century story, as you are looking at England about 150 years ago and the beautiful but also some things that are just common for that age. The graphics itself is done very carefully and with great clearness, with nice touch to the places where you are able to zoom in to take a closer look. There are ‘dark’ places in the game, however that all is implied by the gameplay as we are talking about very dark times too. The sounds are there to give the final touch of spooky and scary and they do a very good job at that giving a complete atmosphere of a criminalistics novel and the scenes of danger and adrenalin rush. The game has its minor flaws, but all of us are accommodated to that because in this type of games the good prevails the bad, including the game characteristics and not just the story.